Shop Royal Worcester china, including plates, mugs, discontinued lines, and more, from ECookShop and get free delivery on orders over £50. At ECookShop we stock discontinued Royal Worcester lines as well as some of the most recent pieces. We also have items from the brand’s parent company, Portmeirion Group, and from other ceramic and pottery companies. We are the official website of Dawson’s Department Store, which is based in Clitheroe, where you can find a host of homeware items. As well as kitchenware, you can buy everything from barbecues to garden furniture, bed linen, and more. Visit us to see the full range of what we have to offer, call with any questions about specific items, or buy online. If you place an order of £50 or more, we will deliver your order free of charge to your UK address. Royal Worcester is a premium pottery brand, and one of a large number that are or have been based in Stoke on Trent. It has enjoyed Royal patronage since the days of King George III in 1789 and this has been renewed by every monarch since this date. The company is well known for its production of figurines and pottery scenes, but it is arguably the plates for which they are best known. 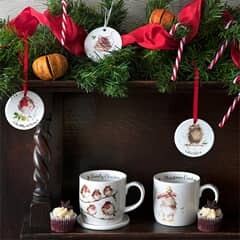 Today, they offer items ranging from mugs and cups to plates and even full Royal Worcester dinner sets. There are numerous ranges that are available; many of which come in a host of different colours, which means that you can choose a colour that best matches your décor, your dining table settings, or simply your personal taste. Royal Worcester pieces are also popular as gift items, many of them being considered potential collectors’ items of the future. Royal Worcester was established in 1751. A surgeon, named Dr John Wall, created a recipe for soft paste porcelain and a factory was built on the banks of the River Severn after Wall convinced a group of 13 businessmen to invest in the idea. The placement of the factory was important because it meant that it was possible to transport materials and the finished products by water to the rest of the country. During the factory’s early days, their patterns were mostly those of blue and white porcelains but following the granting of a royal warrant by George III in 1788 and subsequent warrants issued by the Prince of Wales and the Princess of Wales in 1807 and 1808 respectively, popularity and production both increased. In 1976, the brand merged with its former competitor Spode. Production was moved to Stoke, with some production controversially being taken overseas, and the company struggled at the beginning of the 21st Century. They went into administration in 2008 but, fortunately, in 2009 the brand name and its designs were bought out by Portmeirion Pottery, which would go on to rebrand as Portmeirion Group. The brand is still known by the name Royal Worcester, despite its new ownership, and production has returned to the UK, in Portmeirion’s factories. Royal Worcester bone china mugs are an affordable way to enjoy owning items from this iconic brand. 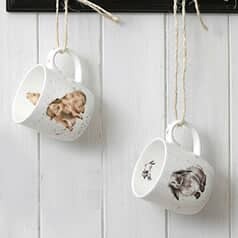 Porcelain mugs are a popular choice because the material allows drinks to retain heat, but without heating up the outside of the mugs too quickly. This means that you can enjoy a hot drink without burning your fingers while holding it. Fine china is also popular because it is easy to clean, and you won’t be left with bits of dirt or grime in any pores of the porcelain. When buying any mugs, including Royal Worcester mugs, look at the size of the product as well as its design. Some people prefer smaller mugs while others want to hold as much liquid as possible. Check the volume that a mug holds, and consider buying in sets so that you can be sure of getting the same design with every mug that you use. You can also buy plates and dinner sets from this iconic British brand. In fact, the full dinner sets are a great way to fill the kitchen cupboards with high quality diningware. Buying a set means that you don’t have to shop around for every individual item and it also means that you can save money when compared to the price of buying every single piece individually. A typical set includes 4 large plates and 4 side plates, 4 bowls and 4 mugs. 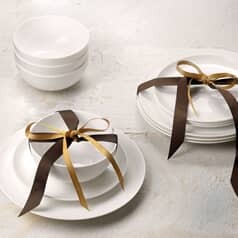 Buy additional pieces from our collections in order to expand the range of items that you have or to provide great looking porcelain for more guests. Royal Worcester regularly update their porcelain lines. This means that there are new designs for you to enjoy, but it also means that they sometimes discontinue a particular line. If you already own part of a set, you’ve damaged or broken an item, or you want to buy additional pieces from these lines to ensure that you always have a replacement if you do suffer a breakage, then you can buy discontinued Royal Worcester pieces. We have a selection of some of the more popular and some of the most recent discontinued lines. The Evesham design was one of the company’s popular designs in the 20th Century, and you can still buy some Evesham pieces. The modern Evesham design is very similar to the original, but the modern pieces can be placed in the microwave, although you should still avoid placing them in the dishwasher because this may cause the gold rim to fade over time. Evesham pieces include bowls and plates, mugs, and even ramekins, and you can buy full dining sets that feature this recognisable design. 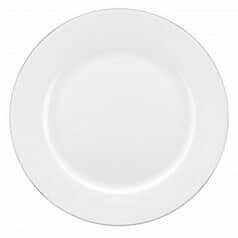 Bone china is a mixture of porcelain and bone ash. 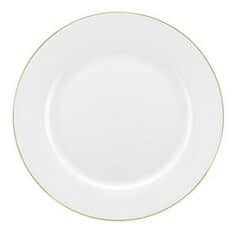 Hard paste china is quite easy to break, whereas Royal Worcester China, which is a soft paste china, is much more durable and a lot tougher. It should be resistant to chips and it is surprisingly difficult to cause damage even to thin items. 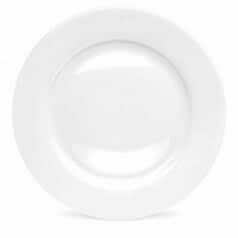 Bone china also has a beautiful white appearance. If left plain, the fine white bone china really makes a simple but elegant finish. It is a translucent material, so if you hold it up to the light you should see a small amount of light shine through. The ox bone ash also has a unique finish that is like no other material on the market. Although there is some dispute over whether Royal Worcester or Royal Derby can lay claim to being the oldest surviving ceramics company, there is no disputing that Royal Worcester is one of the oldest and one of the best known names in porcelain. They have been producing high quality, soft paste bone china products for more than 200 years. They have had their manufacturing returned to the UK, following their acquisition by Portmeirion Group, and they continue to launch line after line of popular porcelain and fine china pieces. 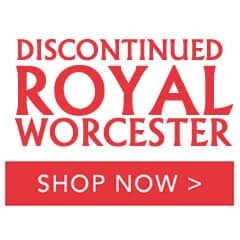 You can buy discontinued Royal Worcester as well as some of the latest pieces and designs, from ECookShop. We have a large selection, offer competitive prices, and you can buy from our Clitheroe based department store or via our website. Place an order over £50 and we will deliver to your UK home address. What’s more, we will ensure that every piece arrives to you in the condition that it leaves us. Buy your Royal Worcester fine china today. Royal Worcester can lay claim to being one of the two oldest UK porcelain brands that are still in operation. They were established in 1951 and, although they have been part of the Portmeirion Group since 2009, they continue to produce high quality and highly sought after ceramicware for the dining table and the home. 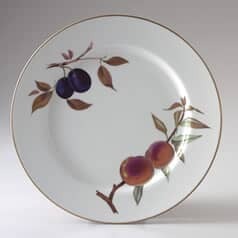 The brand has such an important part in British history, in particular to its industrial progress, that there is a Royal Worcester museum, which shows off some of the company's most prestigious designs and gives an insight into the history of the company and its popular porcelain pieces. Today, you can buy pieces from the Serendipity set, the popular Botanic Garden set, and the Wrendale Designs range.